The Reverie Rally 350 Carbon Fibre Steering wheel is the larger cousin of the Rally 330 steering wheel with a 350mm outer diameter. Available untrimmed or trimmed in plush Alcantara, like the 330, the Rally 350 is available in a variety of drilling patterns including MOMO/Sparco/OMP, Nardi, 3-Stud and Raid. Undrilled and customer specified drilling patterns are also available. The Rally 350 is available with two or three button holes allow fitment of buttons/switches to the wheel spokes. Weighing from just 330g, the Rally 350 has been designed for the most rigorous usage on the track. 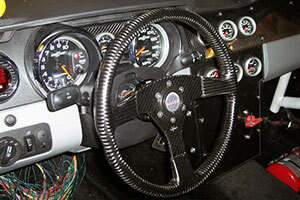 View our full range of our Rally 350 steering wheels. Below, first select which drilling pattern you require (if you require a special drilling pattern, please contact us first), then select untrimmed or Alcantara trimmed, then select whether you require 2, 3 or no button holes.